Syria has intensified its bloody military crackdown on pro-democracy demonstrators, as international criticism against the government’s action mounts. Gunfire continued Tuesday in the flashpoint city of Daraa, where an armed assault to end anti-government protests was in its second day. Human rights activists say at least 34 people have been killed and dozens more arrested since Syrian troops and tanks entered the city at dawn Monday to crush the demonstrations. Residents were said to be too afraid to venture out in Daraa. Electricity, water and telecommunications to the city remain cut. Also Tuesday, thousands of riot police deployed near the coastal city of Banias and in two areas on the outskirts of the Syrian capital. Activists say clashes have been especially brutal near the town of Douma. Demonstrators who attempted to enter Damascus from there during the last two weeks were met with bullets. More than 400 people have been killed since pro-democracy protests erupted last month. The Syrian rights organization Sawasiah said Tuesday the government has arrested at least 500 people during the ensuing crackdown. Also Tuesday, the international response to Syrian President Bashar al-Assad’s brutal crackdown intensified. 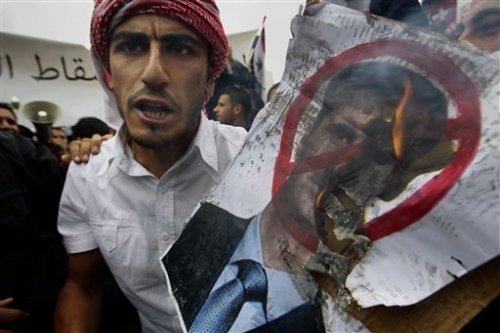 The U.S. ambassador to the United Nations accused the Syrian leader of “disingenuously blaming outsiders” for the protests. Susan Rice also reiterated that Washington has evidence of active Iranian support for what she called Syria’s “abhorrent and deplorable” crackdown on peaceful demonstrators. She said the “outrageous use of violence to quell protests” must end now. U.N. Secretary-General Ban Ki-moon also condemned “the continuing violence against peaceful demonstrators,” including the use of tanks and live fire that have “killed and injured hundreds of people.” The U.N. chief has called for an independent inquiry into the violence. But Syria’s U.N. envoy said Damascus is capable of undertaking its own transparent investigation into the deaths of anti-government protesters, rejecting outside assistance. Bashar Ja’afari also said the U.N. Security Council “should not rely on media reports” when making its decisions. Britain, France, Germany and Portugal asked the council to condemn Syria’s crackdown in a draft statement circulated on Tuesday. Ja’afari told reporters Syria regrets civilian casualties, but said the unrest has “hidden agendas,” adding that some foreign governments are attempting to destabilize the country. Earlier Tuesday, ltalian Prime Minister Silvio Berlusconi and French President Nicolas Sarkozy urged Syria to “show moderation” and halt the “violent repression” of peaceful demonstrations. Turkish Prime Minister Recep Tayyip Erdogan telephoned Mr. Assad and urged him to show restraint. British Foreign Secretary William Hague said the European Union is exploring possibilities for action against Syria, including asset freezes and targeted travel bans on the country’s leadership. While U.S. officials have condemned the violence against Syrian citizens, Defense Secretary Robert Gates and his British counterpart, Liam Fox, played down the likelihood of a Libya-style intervention in Syria. At a joint news conference in Washington Tuesday, Fox said the world’s response to popular revolts across the Middle East and North Africa must reflect the circumstances in each country. Gates made a similar point, saying that although the U.S. applies its values to all countries in the region, its actions will not always be the same. A U.S. State Department official said Tuesday that, for now, Washington will limit its response to diplomacy and possible sanctions.